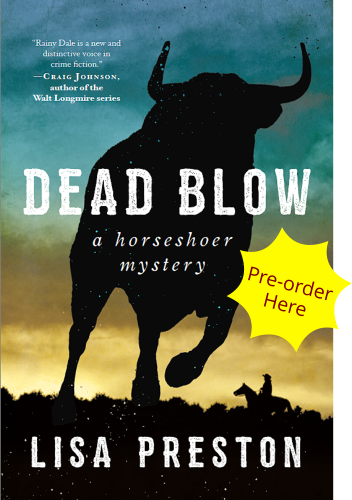 A terrific second book in the new Horseshoer Mystery Series, featuring the incorrigible female horseshoer, Rainy Dale. A dead blow hammer leaves little to no mark on the surface it strikes. It’s not a shoer’s tool, but horseshoer Rainy Dale knows them and knows there are more questions than answers about how her new client became a widow. The old woman says there was hardly a bruise on her dead husband. Why was he driving his tractor so dangerously near the killer bull? How long did it take him to die after the machine rolled and pinned him? The whole town seems aware of the dead man’s wandering eye. Did the widow know? It all happened just before Rainy came to town, about the time that her fiancé, Guy, volunteered with his buddy to help search for a young woman who went missing from Cowdry, Oregon. Rainy is supposed to be making wedding plans and friends, but she can’t help being drawn into the town’s old intrigues. Once again, Rainy will have to dig deep and use all the tools in her box to both defend herself and the people she's just learning to love.